SERVPRO crews are IICRC certified. SERVPRO of Waltham/Weston/Watertown/Wayland prides itself on doing every job by the book. Depending on the job, we apply the appropriate IICRC standard.. The IICRC, or the Institute for Inspection Cleaning and Restoration Certification, is a third party certification organization that we take recommendations from. This organization publishes the standards for the restoration industry. They issue certifications to our employees upon passing certifying exams and they also approve our training programs. The most important standard that is published for us by the IICRC is the S500 Standard and Reference Guide for Water Damage and Restoration. 80 percent of our revenue comes from water restoration. In our many years of experience in the industry, we have seen that most fire restoration and mold remediation jobs often include water damage that we also need to attend to. Our technicians have become masters in the science of drying. They are savvy with our equipment and know how to properly set it up to aid in the drying process. They know and understand the impact that temperature and humidity can have on the drying process. We understand the importance of safety on the job site. Our crew demonstrates this while on the job site and also informs the property owners how to be safe on site as well. For fire and soot cleanup we follow the guidelines given to us by the S700 Standard for Fire and Smoke Damage Restoration. Cleaning in the wake of a disaster is not an easy task. Adding heat, soot, and smoke damage to the mix can make the process very complex. Safety takes top priority for any job. Fire damage can not always be seen at first glance of a disaster. The IICRC-approved training trains our fire restoration technicians to recognize which hazards and stay safe. When treating property for microbial contamination our crew follows the guidelines given to us by the S520 Standard and Reference Guide for Professional Mold Remediation. Our crew is also certified to tend to trauma and crime scene cleanup along with many other specialty restoration services. When disaster strikes your home or business it is critical to tend to the damage as soon as possible, and have the job done correctly the first time to avoid secondary damage down the road. To ensure the damage in your home is treated correctly, it’s important to call the right restoration company. Call SERVPRO of Waltham / Weston / Watertown / Wayland. With our highly trained technicians, certifications, and experience, we will restore your property to its pre-damaged condition and make it “Like it never even happened." Choose SERVPRO for Storm Cleanup in Watertown, Mass. One huge advantage of choosing a franchise in the SERVPRO family is the depth of response we can bring to any size disaster. While weather disasters can be localized, some events are widespread throughout a geographic area. For example, a deep freeze in Middlesex County can cause pipes to burst in dozens of homes and businesses in each city and town we service. Local restoration companies can be overwhelmed with the needs of their communities when a widespread disaster occurs. During large events, SERVPRO of Waltham / Weston / Watertown / Wayland can turn to our corporate office for support. In 2015, SERVPRO franchises came from all over the country to pitch in with the ice dam crisis in 2015. This Storm Team response allowed our franchise to assist more property owners. Once activated, Storm Team brings extra equipment to our area. Franchises send personnel who have been trained to the same standards and offer the same commitment to customer service as our professional restoration crews. And we return the favor. Our franchise went to New Jersey to aid in the cleanup following Hurricane Sandy, and we also sent a crew to Virginia Beach and North Carolina to assist with flood recovery in 2016. When weather events create a disaster at your home or business, you need a partner that can step up to the challenge and muster more resources as needed. SERVPRO of Waltham/Weston/Watertown/Wayland is proud to be part of the team that is faster to any size disaster. Watertown, Mass. residents trust SERVPRO for guidance after a house fire. A fire in your home will change your life. It may upend your living situation and force you to cancel plans. It may push you to make decisions you have never had to make before, including whom to trust. 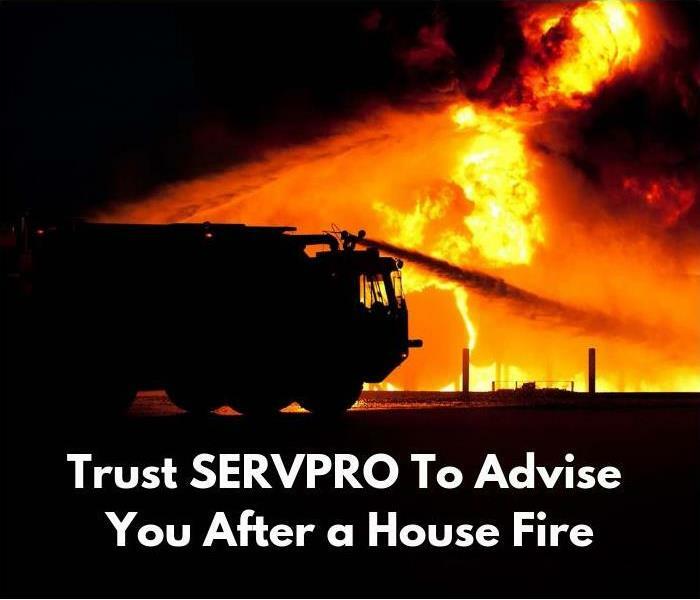 The fire restoration professionals at SERVPRO of Waltham/Weston/Watertown/and Wayland have over three decades of experience guiding residents through the loss, cleanup, and rebuild of their property following a disaster. You need to make important decisions quickly even as you struggle to come to terms with your loss. Our production managers will communicate with your insurance carrier to secure the services necessary to restore your home to preloss condition. No matter how bleak your situation seems today, our entire team’s compassion and empathy will reassure you about the recovery process. Is the HVAC system operational? Are appliances safe to use? If the answer to any of these questions is no, you probably need to make other living arrangements for the time being. In that case, your SERVPRO representative will advise you on securing your property while restoration is underway. Smoke and soot particles in the air contain harmful chemicals that you, your family, and your pets should not breathe. If only part of your home has been damaged by the fire, SERVPRO technicians can erect a barrier to contain the soot while cleaning is underway, and that may allow you to occupy part of the building. We will also recommend setting up a HEPA-filtered air filtration device as soon as possible to start removing hazardous particulates from the air. Did Soot Enter the Ductwork? If your home has ductwork, you probably have soot in there. Turning on the HVAC system will pull the contamination deep into your system and back out through vents to the entire home. SERVPRO fire restoration technicians will block off vents to prevent further contamination and devise a plan to clean the building and the ducts before restoring heat or AC to the building through the ductwork. Depending on the extent of the damage, the fire department may have disabled power to your home. You will need an electrician to inspect your circuits before power can be restored. 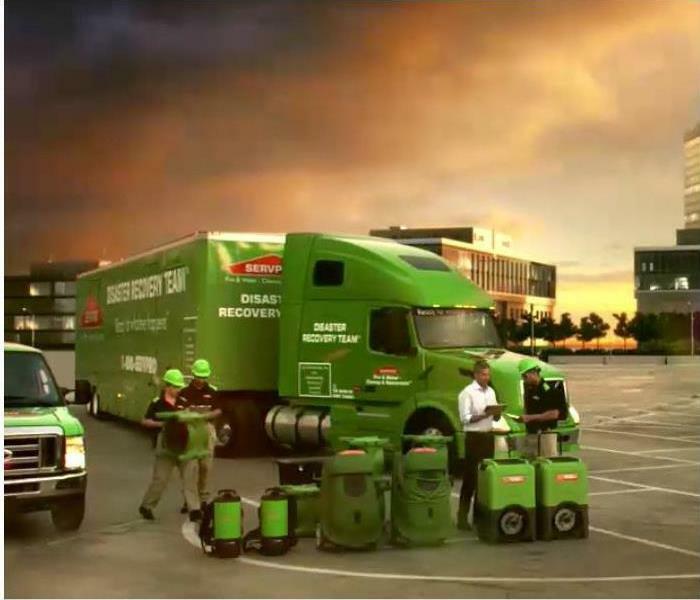 SERVPRO can set up a generator to provide power for the crews and equipment. They can also bring heating or cooling units if necessary to provide the right indoor environment until the electricity and HVAC are restored. Not all smoke damage is visible on the surface. Your appliances may need to be inspected by an electronics specialist before you plug them back in. Otherwise, you might create a short and a new source of flames. 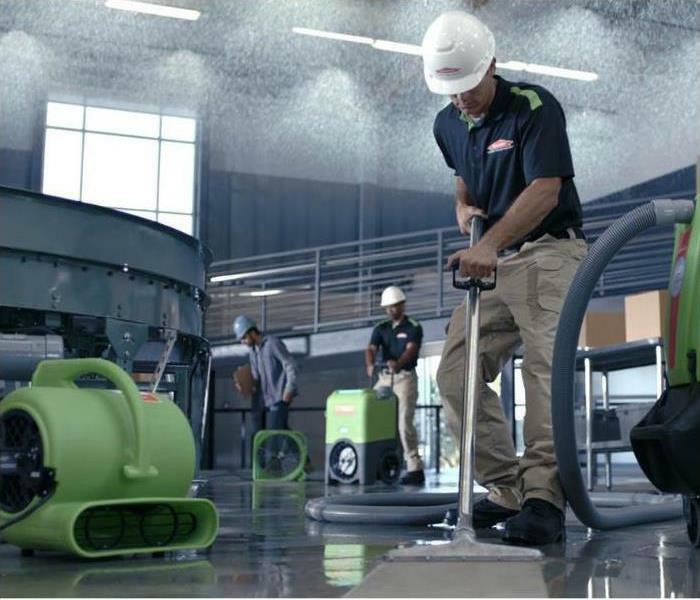 SERVPRO professionals can advise you on what should be inspected by a specialist. They can even recommend trusted partners qualified to make these inspections. Most fire damages are also water damages. Water used to extinguish the flames can cause microbial growth if it is not dried quickly. SERVPRO fire restoration crews are also certified in water restoration by the Institute of Inspection Cleaning and Restoration Certification (IICRC). They will provide all the fans and dehumidifiers you will need to control the loss and avoid further contamination by mold. After the fire is out, you have many decisions to make. Trust SERVPRO of Waltham / Weston / Watertown / Wayland to lead you through your recovery. We can talk to your adjuster and help you develop your plan to restore and rebuild. 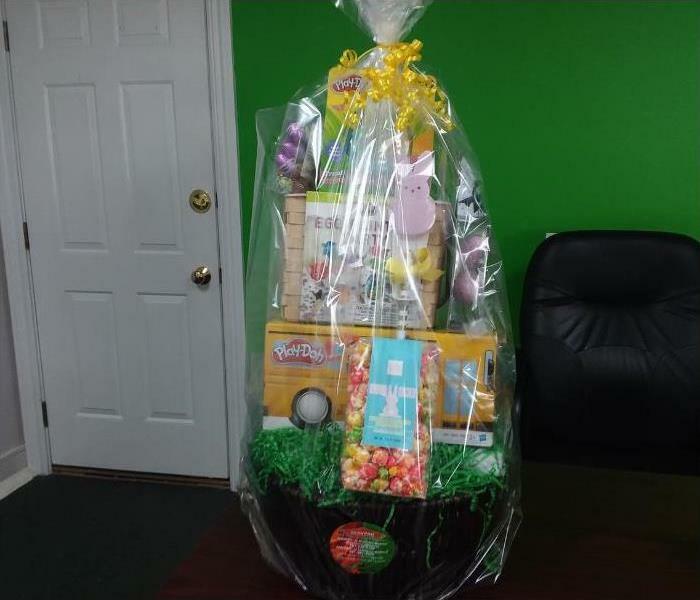 Easter Activity Basket for Waltham Family School Fiesta! Once again, SERVPRO of Waltham/Weston/Watertown/Wayland is proud to support the annual Fiesta! for Waltham Family School with a basket for their silent auction. We call this one the Easter Activity Basket, including PlayDoh, an egg activity kit, Hatchimals and other playful gifts. And yes, we threw in some chocolate eggs as well. The Fiesta! is the biggest fundraiser of the year for the Waltham Family School, and the silent auction will include many great items for bid to help make this their biggest year ever. The Waltham Family School supports parents with literacy challenges and their preschoolers to equip these families with the skills they need for school success. The annual Fiesta! highlights the progress WFS graduates make as they continue their journey through Waltham Public Schools. The students' stories warm our hearts and inspire us all to appreciate things we often take for granted. The party starts this evening at 6:00 p.m. at Solea Restaurant on Moody Street and is always well attended. If you would like to learn more about the Waltham Family School and the work they do, they are hosting an open house they call Coffee and Conversation on Tuesday, April 4 from 9:30 a.m. - 11:00 a.m. Localized flooding can happen just about anywhere. Too much water plus too little drainage means water building up in lower areas. These lower areas are relative to the land around them. We frequently respond to flooded basements on high on hillsides when the water flows down from above. 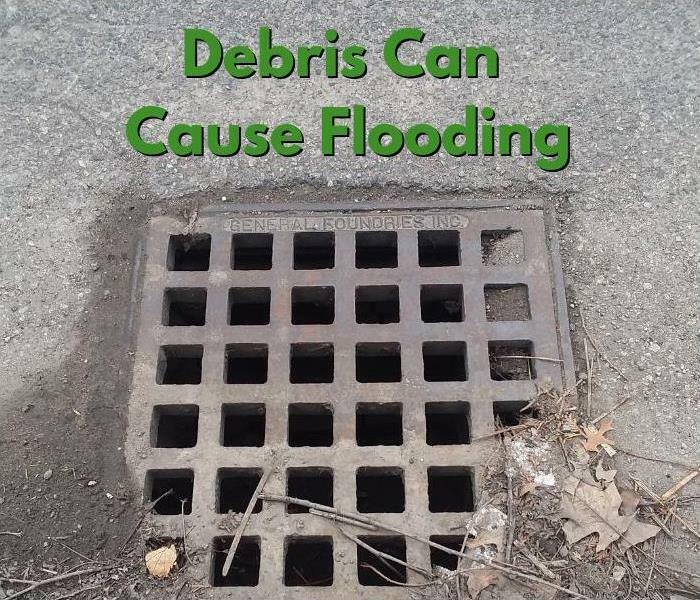 You can help protect your property from local flooding by keeping the storm drains in your neighborhood clear of debris. Trash and leaf litter get caught in the grates protecting storm drains and catch basins. Spend a few minutes to shovel out storm drains after snow storms, and be sure to check them weekly during the spring thaw. Snow melt at this time of year coupled with rainstorms can cause a lot of water to rush through your area all at once. Proper drainage is key to keeping that water out of your home. If your home suffers local flooding, we are here 24/7 to respond to your call. Let us help you protect your investment and get it dry as soon as possible. It is amazing how much damage water can do in a very short time, especially when the water starts from an upper story and flows down through multiple floors. When ceilings and floors are saturated and the water has wicked at least 24 inches up the walls, we call that a class 3 water damage. These losses take extra time and can require special equipment to dry. In January, our franchise responded to a water damage in a two-story commercial building caused by a broken pipe in the top floor ceiling. The top level was a vacant office space and the lower level was a cross-fit gymnasium. 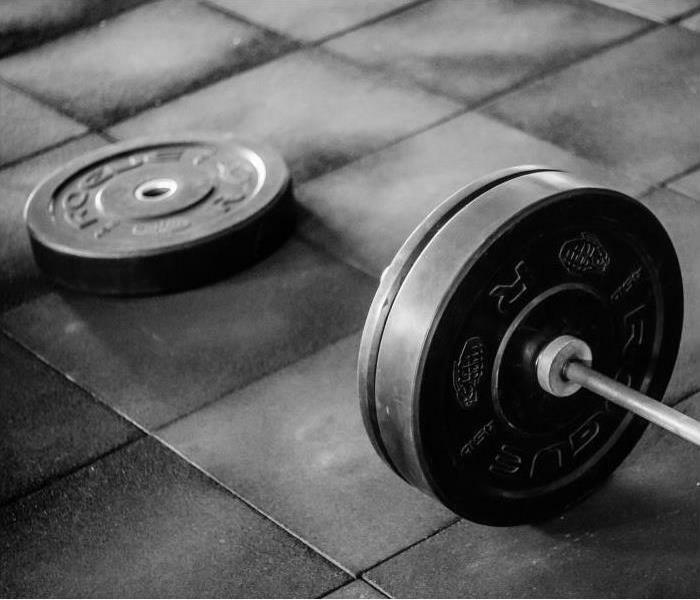 All appeared to be fine when the gym closed for the evening, but by the time the gym opened the following morning a burst pipe in the upper level ceiling had affected the ceilings, walls, and flooring of both levels. We received the phone call at 9:15 a.m. and our production manager was onsite by 10:00 a.m.
At that point, the upstairs office had wet carpet, baseboard, drywall, insulation, and ceiling tiles, while the cross-fit gym had wet wall paneling, drywall, insulation, ceiling tiles, rubber floor mats, and concrete. In addition, we found microbial growth on the walls of the sprinkler closet of the utility room. To begin, our technicians extracted as much water as possible from the carpets and gym mats. They set up forty air movers and five LGR dehumidifiers to start drying the building and two HEPA-filtered air scrubbers to pull microbial spores and particulates out of the air. Our mold remediation technicians also had to address the microbial outbreak in the sprinkler closet. They built negative-air containment around the sprinkler closet to keep microbes and spores in there from spreading to other parts of the building. Our crew could not start on demolition of unsalvageable materials until asbestos testing was completed in accordance with Mass DEP Law 310 CMR 7:15 (4). Once the asbestos testing lab said it was okay to proceed, they performed demolition of affected ceiling and walls that contained wet insulation. Our technicians applied a botanical anti-microbial product to all wet surfaces to discourage mold growth. In the sprinkler closet, they used a HEPA-filtered vacuum to remove all visible microbial growth from non-porous surfaces. They also removed wet drywall in that area and disposed of it, as contaminated organic materials cannot be salvaged. When all rebuild work was completed in the building, we went back to clean the carpets and gym mats. It took seven days to dry all areas of this building, all from one leak in the ceiling that flowed unchecked for roughly twelve hours. However, we were involved soon enough to save the flooring and avert microbial growth. Because this building owner acted so fast, we were able to save carpets, mats, and other building materials. The gym was back in business and the office available for occupation much sooner because the restoration project was not a total gut rehab. When your business suffers a water damage, every minute counts. Do not hesitate to call us at 781-647-9100 at the first sign of water intrusion in your Waltham area commercial property. We are committed to getting you and your tenants back in business. When a furnace malfunctions and creates a puffback, the soot gets everywhere. 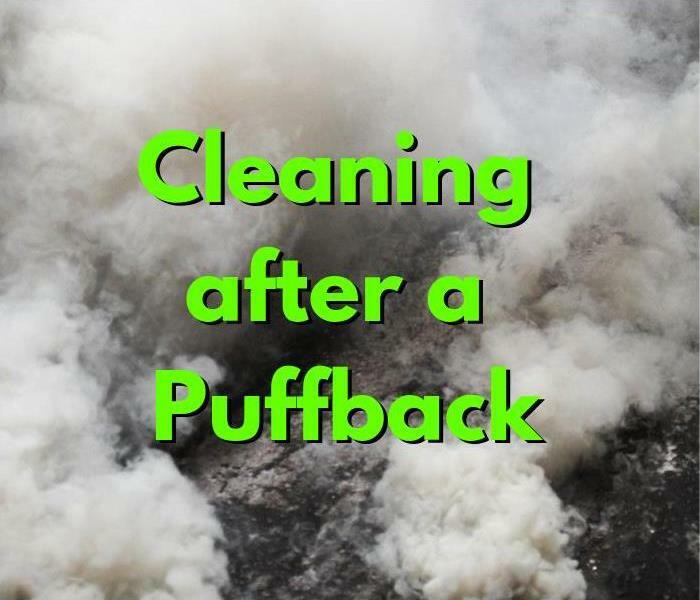 Puffback victims are often amazed to find that soot has crept through every crevice in a building to coat the back of cupboards and closets, even in rooms far from the source of the malfunction. In many cases, soot enters the HVAC system. The ducts must be cleaned as soon as possible so occupants are not breathing harmful fumes and so soot isn’t redistributed after the restoration. Last month, our franchise was called to a tenant-occupied condominium. A furnace malfunction created a puffback and the soot entered the HVAC system and spread throughout the unit. The owner’s insurance covered the cleaning of all structural surfaces and ductwork and the treatment of the air to remove particulates and lingering aromas. The tenants’ renters insurance should have covered the cleaning of contents, but the tenants opted not to open a claim with their insurance company. They insisted this should be the landlord’s responsibility and were very unhappy to learn otherwise. Do your tenants have renters insurance? Many tenants do not understand that their landlord’s insurance will not cover their contents. And when a tenant doesn’t have renters insurance, they often lose everything after a water or fire loss. Before a disaster, tenants may think what they own isn’t valuable enough to insure, but when everything they own needs to be replaced all at once, the value is priceless. Some landlords require tenants purchase renters insurance before signing a lease. In the event of a fire or flood, no landlord wants to face angry tenants with unreasonable demands. Soot contains many hazardous chemicals and byproducts. One of our first concerns with this condo puffback was installing an air scrubber to remove particulates from the air. We also used a hydroxyl generator and a Vapor Shark to neutralize lingering odors. We performed a thorough duct cleaning using our push/pull technique with negative air pressure to be sure soot would not be redistributed after we cleaned. Finally, we cleaned all structural surfaces in the hallway, bathrooms, bedroom, kitchen, living room, and storage room. This included ceilings, walls, floors, and fixtures. We have been called in to many jobs to fix the problems left after improper soot recovery by uncertified cleaners. Residents find they must deal with odors that recur during high humidity. Ongoing respiratory issue can cause them to suspect he air contains hazardous substances from the original incident. Our Fire and Smoke Restoration Technicians are certified by the Institute of Inspection Cleaning and Restoration Certification (IICRC). Our soot cleaning recommendations adhere to the IICRC S700 Standard for Professional Fire and Smoke Damage Restoration. We work with your insurance carrier and adjuster to get approval for all needed services. Untreated plumbing leaks allow water to remain in contact with organic materials and lead to microbial growth. When the damage is behind walls and invisible, this can result in a major mold remediation project. Last month, our franchise was called to a tri-level home in Arlington, Mass. The sink trap had been leaking inside the wall between the kitchen and laundry room. By the time the homeowner realized the problem, he was already seeing what he thought was mold. When our production manager arrived, he found extensive microbial growth on drywall, inside a closet, under the tiles in the laundry room, and in cabinets and the basement. One of the first tasks in a mold remediation project is containing the infestation and protecting other parts of the home from exposure. We use poles and heavy-duty plastic to erect makeshift walls. An air scrubber then creates a “negative air” environment where any air that crosses the barrier flows into the containment area, not out of it. Every job that involves demolition requires asbestos testing before we can begin, in accordance with Massachusetts DEP law 310 CMR 7:15 (4). Upon receiving the all clear from the testing company, we began removing unsalvageable building materials. We applied a botanical anti-microbial product to suppress any new growth. Meanwhile, our air scrubber’s HEPA-filter was removing spores and particulates from the air inside the containment area. We set up a dehumidifier to pull moisture from the air, which also discourages mold. Without water or humidity, microbes cannot grow. We used a HEPA-filtered vacuum to remove visible microbial growth on non-porous materials. We can never remove all microbes. They are too widespread in the atmosphere to eliminate completely. But we scrubbed what we could see from surfaces and cycled all the air through an air filtration device several times per hour for several days to pull out as much as we could. The best way to avoid microbial growth in your home is to keep it dry. 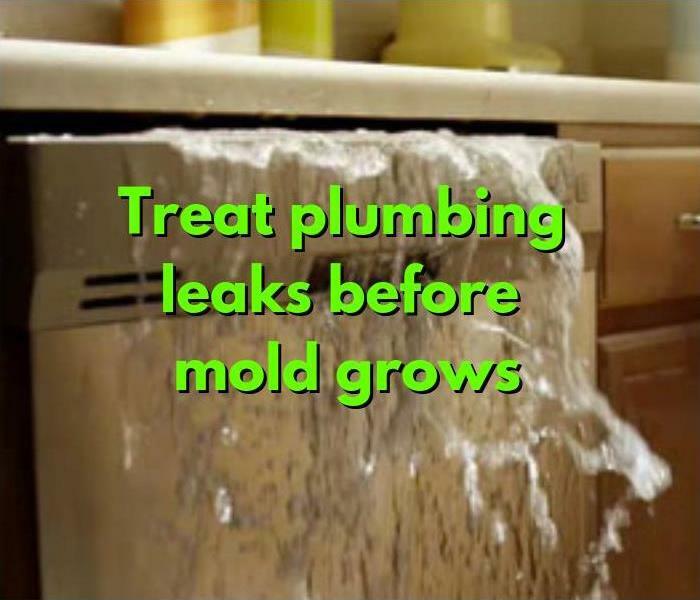 A leak will create an ideal environment for mold colonies to prosper. 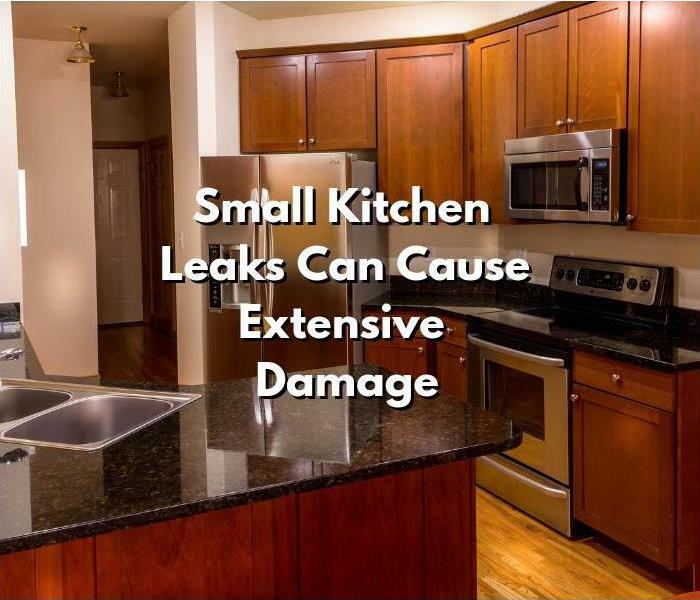 Do not ignore leaks because they always get worse and the damage will spread. If your home is humid, consider running a dehumidifier to bring the humidity down below 50%. This will make it very hard for any microbes to survive and spread. Last month, we responded to a water loss in a single family condominium in Wayland, Mass. caused by the water feed line to the refrigerator ice maker. The line ruptured in an upper cabinet and leaked onto the floor. The water caused the hardwood floor to buckle. Water then migrated through the floor and down into the lower level family room, which has a drop ceiling with insulation above. Water also traveled into the ceiling plumbing chase and behind the walls down to the carpeted floor. Due to serious health issues with one of the inhabitants, the policyholders were concerned about particulates and contamination in the air. Our water restoration technicians set up heavy-duty plastic sheeting to keep any microbial spores in the air contained in the area of the loss, so the occupant with health issues would not be further exposed. We applied a botanical anti-microbial product to wet surfaces to discourage growth of mold and other microbes. Because this job included demolition, we ordered asbestos testing before removing materials that could contain asbestos in accordance with Massachusetts DEP law 310 CMR 7:15 (4). The results came back negative, so our crew was able remove wet insulation, ceiling tiles, baseboards, carpet padding, and cabinetry. Six axial air movers (fans) circulated the air to speed up evaporation, two LGR dehumidifiers pulled the water vapor out of the air, and two HEPA-filtered air filtration devices (air scrubbers) removed microbial spores and other particulates from the air. Our crew drilled holes in the base of the walls to allow air to circulate behind the walls and speed up drying. Because the wood floors had already begun buckling, we installed an Injecti-Dry wood floor rescue mat system. This allowed us to restore the buckled flooring by drying it more quickly and thoroughly. When all building materials reached the dry standard, we removed the drying equipment and cleaned the flooring. Do you have a plan when the power goes out? 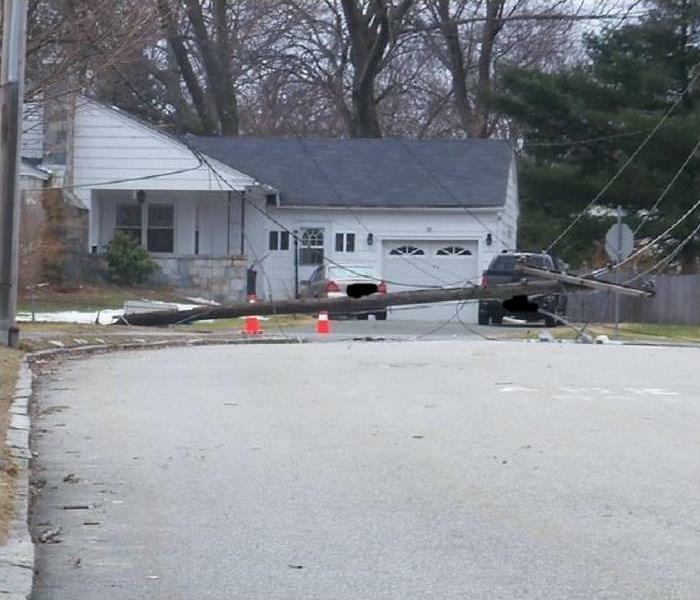 High winds battered Massachusetts this week, toppling trees and knocking out power across the state. Branches fell on cars, houses, and roadways. Other objects were also dislodged in gusts over 50 miles per hour, including a dozen bricks from a building across the street from Waltham City Hall. Utility companies were hard pressed to restore service to everyone who lost. A landlord in Brookline called us yesterday with an unusual request. A branch knocked out power to one of his multi-family buildings. The electrician had fixed the wiring, but the power company would not be able to complete inspection and restore power until today. Meanwhile, the apartments were without power and temperatures were expected to plummet overnight. The tenants would be displaced, and all the pipes would burst if the landlord could not heat the building. Hire a plumber to drain the water from the building. Connect a generator to power the boiler until electricity is restored. And you have to act fast when widespread storm damage has everyone scrambling for services. This landlord had the foresight to complete an Emergency Ready Profile (ERP) before winter storms hit. He had his emergency contact list, and he called SERVPRO of Waltham/Weston/Watertown/Wayland to see if we could provide a generator. We contacted the building owner’s insurance company for authorization and prepared for delivery and installation of a generator. Fortunately, Eversource arrived late in the afternoon—ahead of schedule—and restored power. Our generator was not needed after all, and the tenants were able to sleep in their homes last night. Still, the landlord was pleased we were responsive and willing to help. And we always appreciate the opportunity to demonstrate the value of an ERP. Our team creates free ERPs for commercial properties. Give us a call today at 781-647-9100 to schedule emergency planning with a highly responsive restoration company. 4/9/2019 - Choose SERVPRO for Storm Cleanup in Watertown, Mass.